What is Halloween without marshmallow pumpkins? 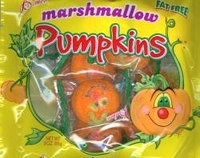 These marshmallow pumpkins sure are tasty little guys from Palmer Candy Company. Not only are they yummy but they are fat free too. Be the hit of the school Halloween party with these party favors. Just whip up some cupcakes, use chocolate frosting sprinkle the edges with green sprinkles then place a pumpkin in the center. The kids are going to love them, so will the adults. Each bag of pumpkins contains 10 individually wrapped pumpkins. Hurry order early as quantities are limited.